As we enter February, I am sure you will be as pleased as I am to see the first snowdrops and the days gradually getting longer – spring is on its way! Last month I mentioned the newly published NHS Long Term Plan which sets out the way the NHS will work in England over the next 10 years. In this issue you can find out more about plans to increase social prescribing and how you can have your say in your local area. As always, we continue our work to raise awareness of CNHC. We have been able to take advantage of some very favorable rates to include additional adverts in the Daily Mail Scotland and in the Guardian’s Health & Wellbeing supplement weekend edition. Back in 2017 CNHC contributed to the Charity Commission’s consultation on how it makes decisions about charitable status for organisations that use or promote complementary medicine. The Commission has published its report and I’m delighted to say has taken on board the need to look at evidence such as patient-reported outcome measures (PROMS) when making its decisions. You can read more about the report below and on our website here. Finally, I was also pleased to read the All-Party Parliamentary Group on Integrated Health’s report to MPs on the part complementary healthcare can play in improving the nation’s health. CNHC contributed to this report alongside over 100 complementary and alternative medicine (CAM) organisations. Again, you can read more on this below and on our website here. Plenty of food for thought, and as ever, lots for us all to feel proud of as we move forwards in 2019. Wishing you a productive month. As reported in last month’s issue, the January 2019 NHS Long Term Plan sets out a direction for the NHS in England over the next 10 years. A cornerstone of the plan is to give people greater control over their own health which includes plans to roll out social prescribing. Social prescribing gives GPs, nurses and other healthcare professionals the chance to refer patients to non-clinical support such as community and voluntary based activities. It usually works through a link worker who supports patients to get involved with local activities and resources ranging from swimming lessons to community cafes and stop smoking services. This could be good news for CNHC registrants if they are recognised as part of the wider public health workforce meeting a local need. CNHC continues to make the case for this recognition. We encourage CNHC registrants to have their input into how these plans are being developed. You can find and contact your local Healthwatch here. For more information about the NHS Long Term Plan, click here. In March 2017, the Charity Commission launched a consultation on how the law on charitable status applies to organisations that use or promote complementary and alternative medicine (CAM). CNHC provided a robust response, which you can view here. We stressed that it has been formally accepted that money is not available for randomised controlled trials for complementary therapies. We drew attention to other sources of evidence, including clinical audits, case studies and patient reported outcome measures (PROMS), that are used particularly in the cancer and palliative care sector, and in mental health services. In December last year the Charity Commission published the outcome of the consultation. We’re pleased that the outcome confirms that the basic legal principles that apply to the Charity Commission’s work in assessing applications for charity status by CAM organisations remain unchanged. And we’re delighted to see that additional measurable methods, which are used across many complementary therapies, will now be considered by the Charity Commission for new applicants and when reviewing current charities that use or promote complementary therapies. You can read the full outcome report from the Charity Commission here. Our latest blog is from Jonathan Sarson, CNHC registered Reflexologist, Massage Therapist and Aromatherapist. Read all about Jonathan's experience delivering the complementary therapy service on the Cancer Unit of two NHS hospitals in North Wales. In their first published report ‘Integrated Healthcare: Putting the Pieces Together’, the All-Party Parliamentary Group for Integrated Healthcare (PGIH), urges government to embrace complementary, traditional and natural medicine to assist with addressing the key health issues affecting the country. This report was produced in consultation with 113 complementary and alternative medicine organisations – including the CNHC. 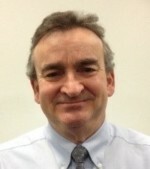 The PGIH recommendations include several that can support the NHS Long Term Plan, and they also call for government to take on board and act on the recommendations in the 2017 report ‘Untapped Resources: Accredited Registers in the Wider Workforce’, published jointly by the Royal Society for Public Health (RSPH) and the Professional Standards Authority for Health and Social Care (PSA). CNHC asks the government and the NHS to consider making greater use of this resource via social prescribing and personal health budgets, to help deliver the New Service Model for the 21st Century, as set out in Chapter 1 of the NHS Long Term Plan. You can read the full PGIH report here. 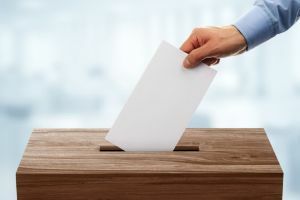 The next round of Profession Specific Board (PSB) elections will begin on Thursday 11 April 2019 for Massage Therapy and Nutritional Therapy. An email will be sent to the CNHC registered practitioners of each discipline setting out the full details and inviting them to stand for election. Candidates are required to set out in no more than 600 words how their background and experience meet our essential criteria using the Election Statement Template provided. Profession Specific Boards (PSBs) are an important part of CNHC’s structure and ways of working. The members of the PSBs provide invaluable expert advice on issues such as the development of our policies and also provide members to be trained to sit on our Conduct and Competence panels. For more information about the role of a PSB member, click here. Any registrant from Massage Therapy and Nutritional Therapy is able to stand for election for the relevant PSB, including those who are currently members of the PSB. The Royal Society for Public Health (RSPH) Health and Wellbeing Awards is the UK’s premier awards scheme for promoting health and wellbeing. Get a head start on this year’s awards by registering your interest. Complete the form here to register your interest and find out when the awards are open to enter. 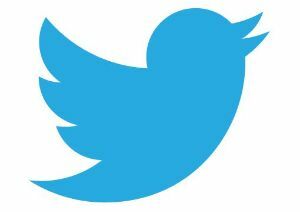 Did you know that CNHC is on Twitter? This is a great platform to keep up to date with the latest news. Please follow us and share our posts. We send out frequent updates with job opportunities, the latest news from us and public awareness posts you can share. or call on 020 3668 0406. 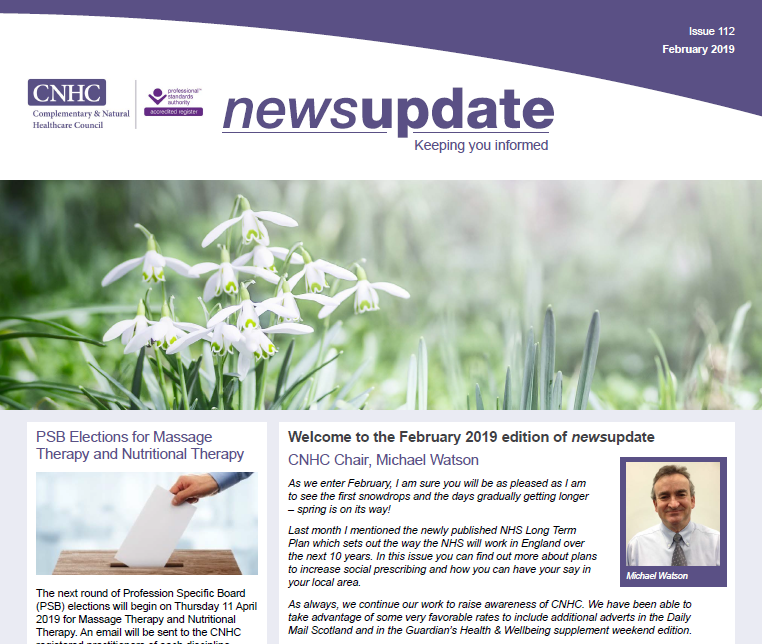 CNHC's newsletter was launched in November 2009. It is sent electronically to all registrants who have an email address and all those on CNHC's contact list.